Busy Lizzie offers a variety of services especially geared toward Small and Medium businesses that need an extra hand daily, weekly, monthly or on a project by project basis. Our goal is to make your life easier, reduce your bottom line and give you back your freedom. 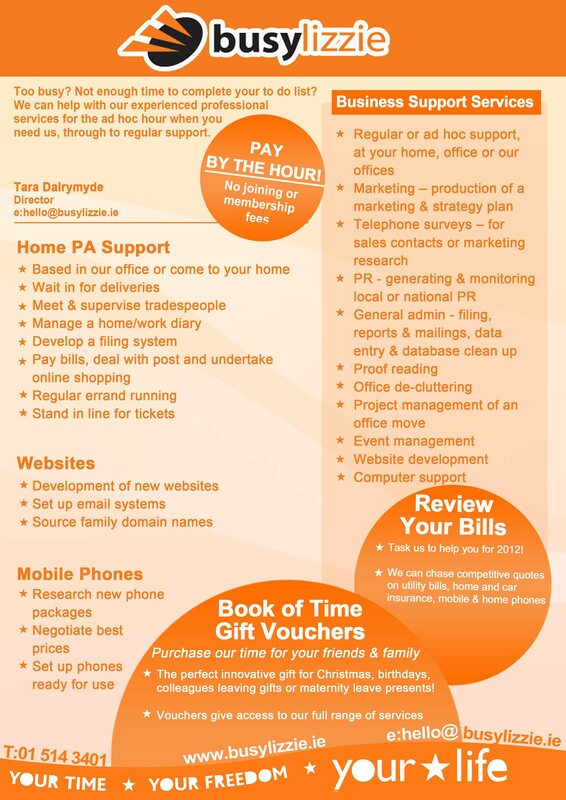 Take a look at the many services that Busy Lizzie has to offer. For a more detailed view just click on each of the headings. A VPA or virtual personal assistant is a person dedicated to helping you run your business on a scheduled basis. This person can advise you of daily appointments, make travel arrangements, keep track of your finances and keep your organisation running smoothly. A VPA is a must have for business professionals who need to keep on top of their agenda. Our VPA’s put structure into your daily routine. Once you hire a VPA from Busy Lizzie, you’ll be wondering how you ever survived without one before. We understand that you don’t always need to hire someone full time to answer your calls, send e-mails and provide customer service. We offer the opportunity for you to pay for only the time you need from our expert administrative pool of employees. Our staff can work virtually or in your office. With many years of experience, our staff can easily acclimatise to your surroundings and make you feel like they’ve been with you for years, if only for a couple of hours. We have a creative team ready to make your business website and print ideas a reality. Our dedicated team can provide a thoroughly laid out plan for your organisation with SEO friendly web copy and eye catching print designs. We can design and print any item necessary for your organisation from business cards to Posters. No job is too small and with our team of experts you’ll be reaching your target audience with attention-grabbing copy. We offer customised e-marketing campaigns that include e-newsletters and e-shots targeted directly at your customer base with integrated html so our e-mails look just like your website. In addition, with our tracking capabilities, we will be able to track which links in the e-newsletter are getting the most attention. These campaigns can take place on weekly, monthly or whatever frequency you wish. With the recession underway, now is the best time to put your name in front of your customers before you competitors do. We provide a comprehensive bookkeeping service that covers all the areas necessary to keep the records of your accounts complete, accurate and easy to access. Our expert bookkeepers can keep track of your revenue and expenses, submit your VAT returns, provide end of year accounts to your accountant, as well as look after your weekly or monthly payroll. We can use the computerised accounts package and/or payroll package of your choice, and with our Pay As You Go Bookkeepers we can provide you with the service you need as and when you need it. Maybe you are a new start-up business or a well established business that needs now to computerise your accounts. We can also advise you on the most suitable package for your business and how to incorporate it into your company. If your office space is not organised then you might be wasting time searching for precious documents. In a matter of hours we can organise your office and make it easier for you to get your work done. Our filing system makes it easy for you to access all the documents necessary for you to run your business. Once organised, you’ll be able to focus on the task at hand and not searching for lost items. When your average worker spends at least 40 hours a week at the office, this leaves little time for the employee to take care of personal matters. Sometimes they need to do things during work time or take time off. With our concierge services, we can take care of these time consuming items and provide you with more productive employees. Medical transcription can be time consuming and difficult if you don’t understand the terminology. Our knowledgeable team can provide transcription services for all business sectors.